cataract. Cataract is a condition in which the natural lens of the eye becomes dense and cloudy, thus impairing vision. In cataract surgery, an incision is made in the eye and the affected lens is removed through the incision. In some cases, the lens fiber is kept intact while in others the lens fiber is removed as well. After the natural lens is removed, an intraocular lens implant, commonly known as IOL is implanted in place of the natural lens to improve the patient's vision. When combined with laser cataract surgery, this technique can reduce or eliminate the need for glasses. 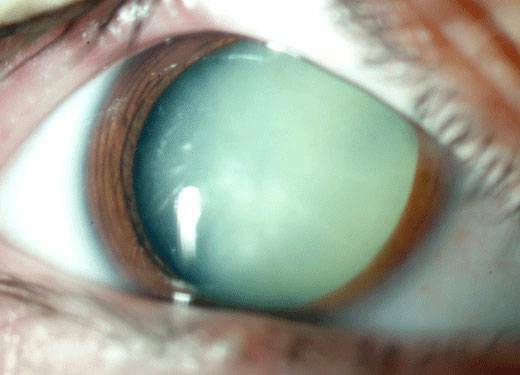 There are two techniques in cataract surgery by which the natural lens is removed. One is the extracapsular cataract extraction in which only the lens is removed and the lens capsule is kept intact. The lens implant can then be placed in side the capsule for a permanent placement. The other, older technique is the intracapsular cataract extraction in which both the lens and the lens capsule is removed. A form of intracapsular lens extraction in which the lens is removed by first freezing it is called cryoextraction. The freezing allows the entire lens, and the capsule to be removed in one piece. The freezing of the lens also reduces its size thus making extraction much more simple and efficient. On of the reasons that this surgery is no longer performed in this manner is that a large incision needs to be made in the eye, and stitches are needed to close it. The surgeon uses a cryoprobe to freeze the lens, which is inserted into the eye through the incision. Once the probe is maneuvered correctly, the surgeon releases a coolant that causes an ice ball to form at the very tip of the probe. The ice is formed at the point where the tip of the probe and the tissue of the eye meet. The tissue then starts sticking to the tip at which point there must be no sudden movements to avoid causing tears or ruptures to the tissue. As soon as the lens has securely attached, the cryoprobe is pulled out of the incision and the lens comes out smoothly without breaking or rupturing in the process. Why is this technique no longer used? There are a few reasons why cryoextraction is no longer used. First, a 6 clock-hour size incision must be made. With modern techniques, a 2 mm incision (less than a tenth of an inch) may be used, without stitches. Second, cryoextraction does not leave the capsule in the eye, so a lens implant can't be used, leaving the patient in very thick 'bubble glasses' in order to see well. In addition, the risk of complications such as retinal detachment is worse with this technique. Laser cataract surgery is the latest in the evolution of surgery, allowing even less trauma to the eye, and better vision with astigmatism correction.